Finally I find some time to route the hull supports and associated parts. 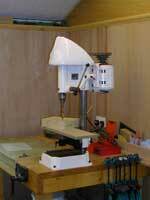 The delay I have now is upgrading my bench driller. I've given up on the toy and acquired a real one. I'm not sure of it's vintage but it's certainly got more metal in it than anything you'd buy today. 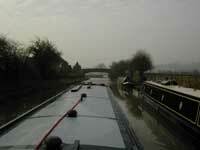 Five days after mooring up at Calcutt we were on the move again. This time a short 2 day run down to Lower Heyford. 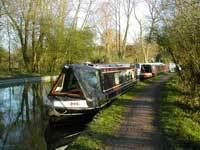 The Oxford canal is very picturesque but exceeding slow going when you're in a hurry. You've barely got started then you spend the next 2 hours circling the same Windmill. After lunch outside the canalside pub at Fenny Compton it was on to Cropredy for the evening stop. 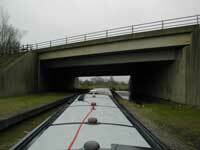 On the approach to Banbury the canal passes under the M40 for the first of three such occurrences. Then onto King's Sutton, Aynho, Clifton, Upper Heyford and finally mooring up at Lower Heyford around 4 o'clock after 35 miles 32 locks. Next morning we awoke to a clear blue sky and were underway by 7:30. Usually we go through Oxford and join the Thames at the Isis lock but this time we decided to try the Duke's cut. 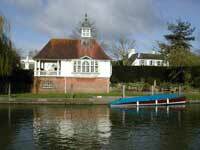 Conditions on the Thames were excellent and there were no stream warnings which is unusual for this time of year. This probably explains why it was so quiet with so few boats out. We made Wallingford by 17:30 and had a lovely meal at the George Hotel.